Developer Pewter Games hopes to attract a new audience to this classic genre with The Little Acre‘s charming story and hand-drawn artwork. Set in 1950s Ireland, the adventure centers around Adrian and his daughter Lily as both set out to aid a parent. Adrian searches for his missing father, and ends up in a land filled with strange creatures. Lily in turn wishes to help her father in his search, and winds up taking on her own adventure. 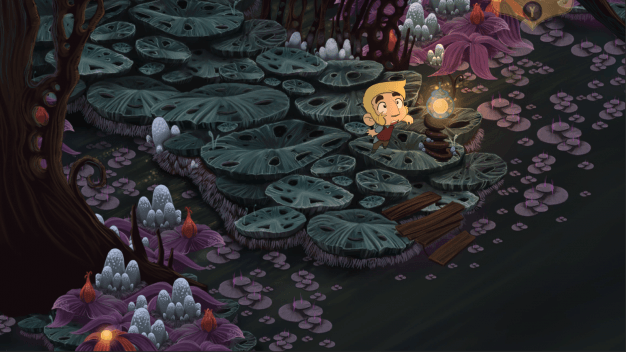 The artwork that makes up both worlds draws inspiration from Don Bluth animation (All Dogs Go to Heaven) and classic Miyazaki films to reinforce the game’s charming narrative. The Little Acre is available for pre-order now for Windows PC and will be available next week for Xbox One and PlayStation 4. A free art book capturing the visuals of The Little Acre will be available with purchase on Steam and console. Find more information on the title’s release at the game’s official webpage.